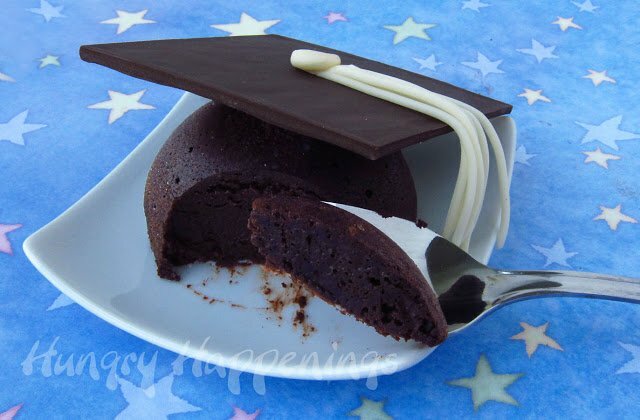 Luscious and creamy flourless chocolate cake graduation caps. May 16, 2012 By This post may contain affiliate links. Looking for an amazing dessert to make for your kids graduation party? 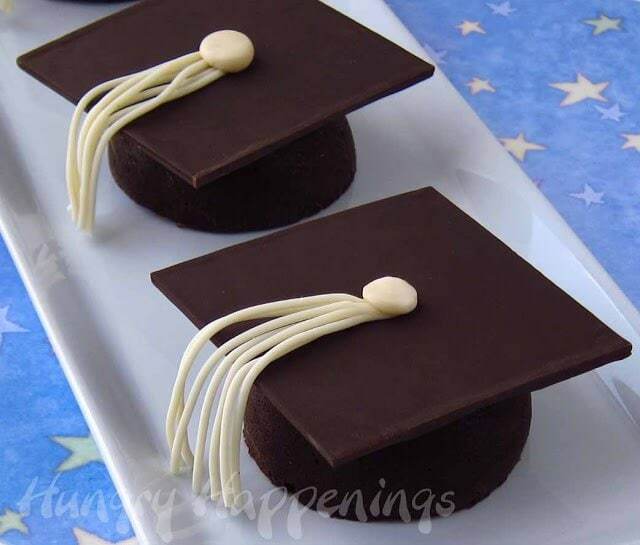 Try making these Luscious and Creamy Flourless Chocolate Cake Graduation Caps, you won’t be disappointed! My nephew is staying with us this week and is enjoying my home cooking. His mom, my sister, is an amazing cook and was influential in teaching me how to cook especially using herbs and spices. However, she is a working woman with a very active son who has something on his schedule every night of the week, so she gets home from work and has to rush off to one practice or another and doesn’t have much time to spend preparing a home cooked dinner on most evening. I don’t get to play mom too often and I have time during the day to prepare a meal, so I have really enjoyed making dinners for him the past few days. We’ve had turkey, pork chops, and enchiladas, so far, and I plan to make roasted chicken and manicotti before he goes home. Aside from green beans, he has eaten everything I’ve cooked. He even poured the Dijon mustard sauce I made last night over his turkey breast fillet. His taste buds have grown up! Today I spent most of the day making these graduation hats and writing this blog post, so a package of chicken nuggets made it’s way out of the freezer and into the toaster oven for dinner. There were no complaints, especially because dessert came in the form of these rich flourless chocolate cakes topped with a square of chocolate and a bit of white modeling chocolate. My nephew will graduate from eighth grade next month, so it was a fitting sweet treat. Whether you have a graduation party to prepare a dessert for or not, you should make this flourless chocolate cake for some special occasion. I’ve had flourless chocolate cakes at restaurants that were sadly lacking in chocolate flavor and, even worse, were dry and dense, but this recipe, adapted from America’s Test Kitchen, is one of my absolute favorite desserts. One bite of this lusciously creamy chocolate dessert and you’ll find it hard to stop at just one bite. a small amount of butter to coat the molds*Use a good quality chocolate with a flavor that you really like as this cake will taste like a creamy version of the chocolate bar you use. The original recipe calls for adding a 1/4 cup of brewed coffee, which will intensify the chocolate flavor, but will also add a coffee flavor to this cake which I don’t care for. If you want to add it, just mix it in before you fold in the eggs. clay extruder, optional – but makes creating the tassel so much easier! Preheat oven and a roasting pan filled with enough water to go halfway up the sides of the silicone mold, at 325 degrees Fahrenheit. 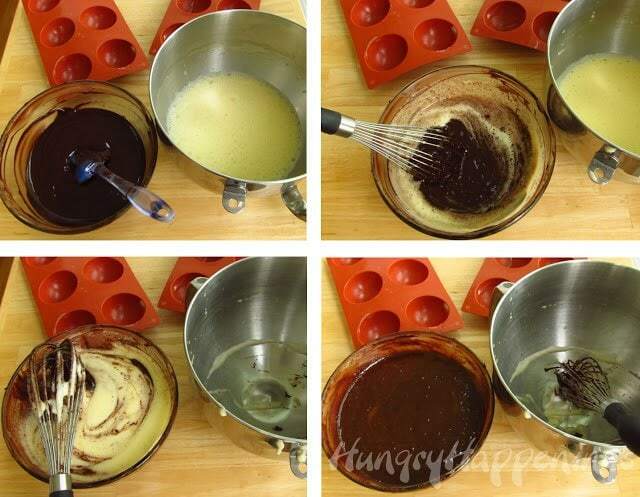 NOTE: You will want to bake your cakes in a water bath so that they will bake evenly and be creamy and smooth. I found it easiest to use a roasting pan with a removable rack for this job. It isn’t necessary, but it sure is handy. I filled my roasting pan with about an inch of water and set it in my oven. Then I preheated my oven to 325 degrees Fahrenheit and allowed the water to get hot. When it came time to place my filled silicone molds in the water filled roasting pan, I set one on the rack and simply lowered it into the pan. I could only fit one silicone mold on the rack at a time, so I baked 6 cakes at a time. Place chopped chocolate and butter in a microwave safe bowl. Heat on high power for 25 seconds. Stir. Heat for 20 more seconds, stir. Heat on 50% power for 15-20 second increments, stirring vigorously after each, until melted. Do not over heat or you will burn the chocolate. Alternatively, you can melt this in a double boiler set over low heat. Whisk eggs in the bowl of a stand mixer on medium, in a mixing bowl with a hand held mixer on medium high, or in a mixing bowl with a whisk until your arm hurts – until the eggs double in volume. You’ll want the chocolate to be warm at this point, so make sure it is warm to the touch. Stir one third of the eggs into the melted chocolate to loosen the chocolate. Fold in the remaining eggs. Butter your silicone molds. Equally divide batter among 18 half sphere silicone mold cavities. Bake for 10-14 minutes until the cakes still looks moist but are set. Insert a digital thermometer into a cake. Once the cakes reach 140 degrees Fahrenheit, remove them from the oven and set on a cooling rack. Using a thermometer is the best way to tell if your cakes are done. Don’t overcook them, or they will become dry. If you, like me, bake these in three batches, just be sure the water doesn’t evaporate too much. If it does, just add more water to the roasting pan and allow it to heat up for a few minutes. Allow cakes to cool completely. Wrap in plastic wrap and refrigerate for at least 4 hours or overnight. Un-mold by turning silicone mold upside down and pressing the cakes out while turning the mold inside out. Keep refrigerated until ready to decorate. Actually, you can keep these cakes stored in an airtight container in the refrigerator for up to 5 days, then decorate them just before your party. Don’t refrigerate the graduation cap cakes once decorated or the chocolate and modeling chocolate will end up with condensation on them. Turn a rimmed baking sheet upside down and set a piece of parchment paper on top. Spread half of the chocolate into a thin layer on the parchment paper. Set it in the refrigerator for about 3 minutes, just until it looses it’s shine but isn’t completely set. It needs to be soft enough to cut through. Cut into 3″ squares using a straight edge and a pizza wheel or knife. I have a 3″ wide piece of Plexiglas that I use to cut my chocolate barks into squares, so I used it here. 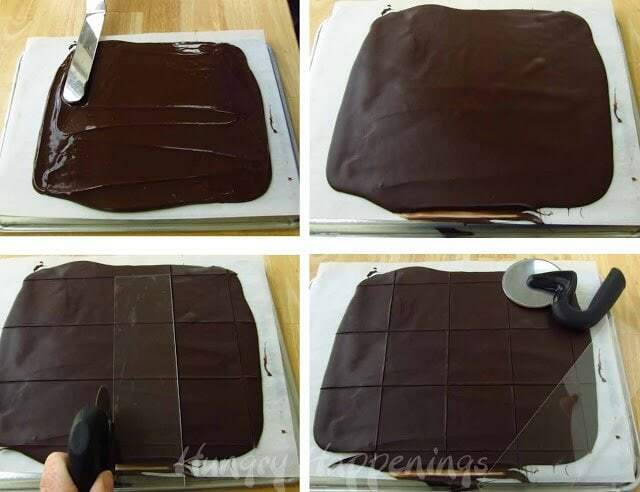 Set another piece of parchment paper on top of your chocolate and set a baking sheet on top of it. This will keep your chocolate squares flat. Refrigerate the chocolate until set about 10 minutes. 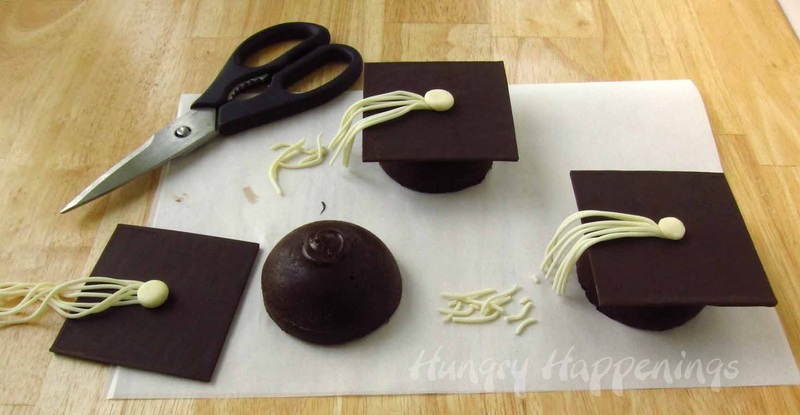 Reserve a small amount of melted chocolate to attach the tassels to the caps, and repeat with remaining chocolate. If you only have two baking sheets, proceed with the next step, then come back to this step. Once the chocolate is set, remove from the refrigerator and peel from the parchment paper away from the chocolate squares. Remove the scrap pieces, which can be used for another project or enjoyed as a snack. If you want your chocolate squares to have more of a shine to them, use a sheet of clear acetate instead of parchment paper. 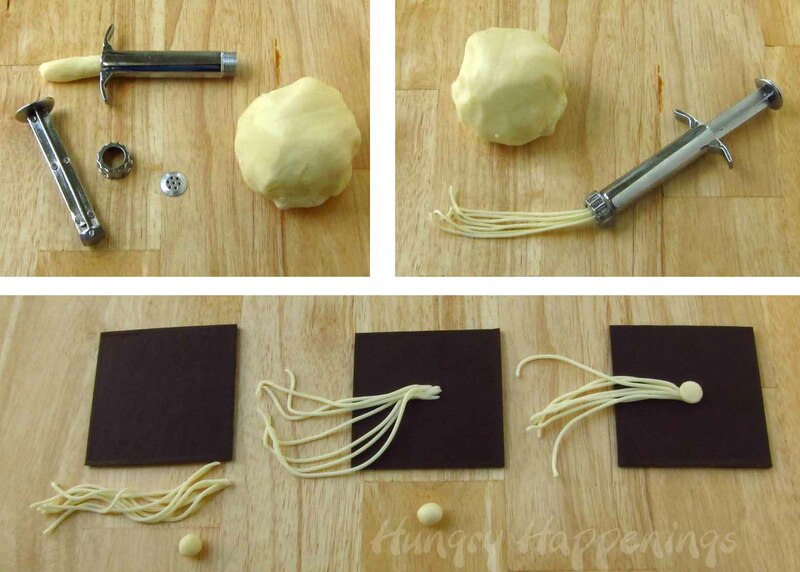 It is easiest to use a clay extruder to make the edible tassels. Use one of the discs that has at least 7 holes for the best results. Knead white modeling chocolate until soft. Pinch off about a tablespoonful and roll it into a log. Press the log into the clay extruder. Extrude a few inches of the clay for each tassel. If you don’t have a clay extruder, you can roll thin logs of modeling chocolate to make your tassels. 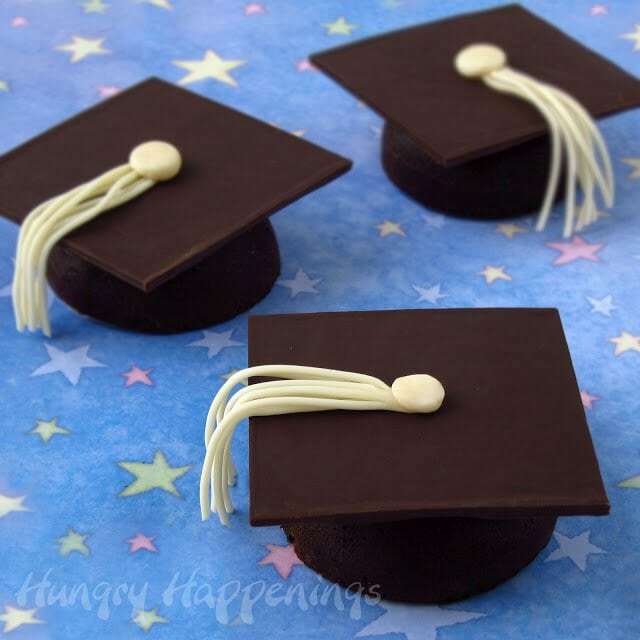 Use some melted chocolate to attach the tassels to each chocolate square – place one end in the center of each square. Pinch off a small piece of the modeling chocolate and roll into a ball. Flatten it and use a dab of melted chocolate to adhere it in the center of the chocolate square covering the end of the tassel pieces. If you don’t have any melted chocolate, you can use corn syrup to attach your pieces. Use a small dab of chocolate frosting or Nutella to adhere the chocolate squares to your cakes. Cut the ends of the tassels off if they are too long. As I said earlier in this post, do not refrigerate these cakes once the chocolate decorations are added. It wont take long at all to top each cake with the squares. You can add the tassels to your squares and store them on your baking sheets until you are ready to attach them to the cakes. If your home is cool (72 degrees or less,) you can remove the cakes from the refrigerator and decorate up to 8 hours before your party, otherwise a few hours before will be best. Not a great idea to serve these at an outdoor party unless you can keep them cool until you are ready to serve them. Oh, my. These are incredible! They look perfect – you must have spent so much time on them. This is perfect timing since my daughter is graduating in a couple of weeks! I will be making these for her party. Thank you very much. I need to hurry up and find someone who's graduating something. I'd like to invite you to link this (and your Cookies & Cream Garden Stone- so cute!! !- and any other projects/recipes you'd like) up on my first link party. Beautiful, and I bet they taste great! I'd love for you to link them up if you get the chance! Yummy! These are gorgeous too. What a great dessert. I need that pan, LOL. Perfect … absolutely perfect! I have got to get an extruder. Cheers to the graduates. This is so cute! Beth, these are so cute!! I may have to attempt them…my son graduates pre-k on Thursday! And we do gluten-free, so I love the flourless part!! So happy you linked up! Have a great week!! It looks great~! Maybe I will make this for our schools preschool graduation! Thanks for sharing and I am a new follower! Oh my goodness – these are brilliant! My link party [The Inspiration Board] is up right now. I would love for you to stop by and consider linking this up! My readers would love it. So fabulous! You are just a food genius! Thanks so much for sharing at Mom On Timeout!